Bangalore: Professor G. Raghuram, Director, Indian Institute of Management Bangalore, has been honoured for Lifetime Achievement by the Mahindra Transport Excellence Awards 2017, supported by the Ministry of Road Transport and Highways in India. 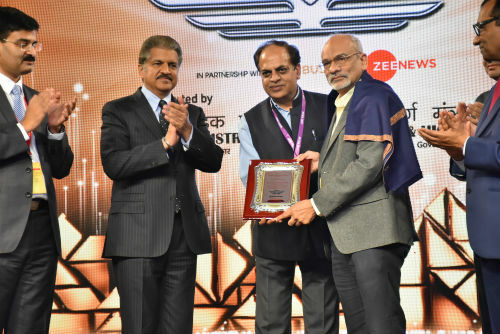 The Lifetime Achievement Award recognises Professor Raghuram’s body of work on the Transport sector in India and lauds him for “decades of outperformance, dedication and generous contribution towards the betterment of the Indian transport industry”. The award was presented to Professor Raghuram in New Delhi on March 7 (Tuesday). It is for the first time since its inception in 2015 that the Mahindra Transport Excellence Lifetime Achievement Award is being conferred on an academician. The earlier recipients include Shri R. Thyagarajan, Founder Chairman, Shriram Group, and Shri D.P. Agarwal, Vice-Chairman and Managing Director, TCI Ltd.
“The Mahindra Transport Excellence Lifetime Achievement Award recognises Excellence, Innovation and Change Leadership in the Transport Ecosystem by recognizing efforts towards accepting no limits, alternative thinking and driving positive change,” said a communique from the Awards Committee. Professor G. Raghuram has a PhD from Northwestern University, USA, a Postgraduate Diploma in Management (PGDM) from IIM Ahmedabad and a BTech degree from IIT Madras. He specializes in infrastructure and transport systems, and logistics and supply chain management. He conducts research on the railway, port, shipping, aviation and road sectors. He has published over 35 refereed papers in journals and written over 155 case studies. He has published six co-authored books, one such book’s enhanced edition was released during the awards ceremony on Tuesday. Professor Raghuram is a member of the Global Future Council on Mobility of the World Economic Forum, Executive Council of the National Aviation University, and of the Board of Directors of six companies in the fields of infrastructure, logistics and education. Overall, he has been on the Board of 12 companies. He has offered consultancy services to over 100 organizations, including multilateral agencies. He has served on various government policy making and advisory committees for the Ministry of Civil Aviation, Ministry of Consumer Affairs and Public Distribution, Ministry of Railways, Ministry of Road Transport and Highways, Ministry of Shipping, Cabinet Secretariat, Comptroller and Auditor General, the Planning Commission and various State Governments.